How to polish RAF Air cadets' parade shoes in the best way? Hi I am a new air cadet in Sussex, I would like to know the best way of polishing new parade shoes from cadet direct? I have been told may different way of polishing the shoes like with fire and polishing cloth, cotton balls hot or cold water. All with normal kiwi shoes polish. But I would like the best way to polish the shoes for my uniform inspection as a PJNCO. Think it means potential JNCO but if you’re so new you don’t know how to polish you’ve prob got a bit of time to wait until you’re ready for stripes. ‘Rank is NOT the be all and end all’ - The best thing my OC told me. Thank you for your opinion about what to do about polishing for PJNCO. And yes AMW potential JNCO. There’s no single best way. It’s what works for you. No 1 Air Mobility Wing, out of Brize? Whilst there is no single “best way” there are a plethora of terrible ways. Forget setting the polish on fire. Forget layering it up and leaving it overnight. Forget basically anything which sounds complicated/risky/or totally bizarre. Cold water, softest cloth you can find, practice. The key is in using the right amount of polish and the right amount of moisture. Once you get the technique it’s easy but in the early stages it’s best to have someone who can do it well guide you. As a new cadet I would hope that your Squadron should give you some practical training. It is very much Individual technique based on personal experience. 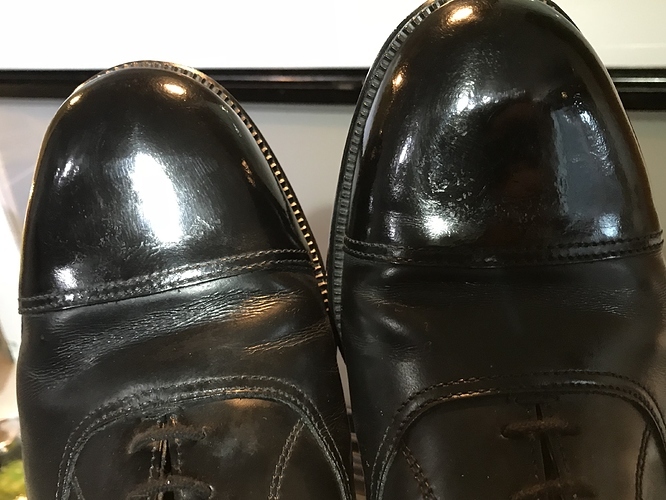 I bought a secondhand pair of shoes*** as an emergency replacement for a cadet (VIP visit that same evening), brushed polished the toe caps to “key” them, then spent about 7 mins polishing each one. Best I could do in the short “rescue” time, I didn’t have longer as I had to dive off to sqn. I used an old (soft) duster that hadn’t had polish on it for about 2 yrs, Parade Gloss polish - & my top secret tip, an ice cube in the water in the tin lid to keep things cold. ALWAYS water on the cloth, in decreasing amounts as things build up, only just a drop or 2 with a very small smear of polish as you finish off. *** Indirect recommendation - Cambridge surplus supply shop has moved to near Barton, on the main road. Very good service. One of my cadets constantly gets scratch marks on his shoes while polishing. He runs them under water to clean before polishing and uses a polishing cloth on decent shoes. Any ideas how to fix this for him? Cheers i’ll let him know. I know he currently uses a Selvyt cloth. Dried/flaky polish can cause issues too, or dust in a tin left open. Sometimes looks ok in the tin. Keep visually checking the cloth/cotton wool and feeling for the grinding.